Swoon…the flea market look. The collected-over-time look. I love the elements in the room above. There is lots of color and texture going on here. This is a casually coastal vignette. 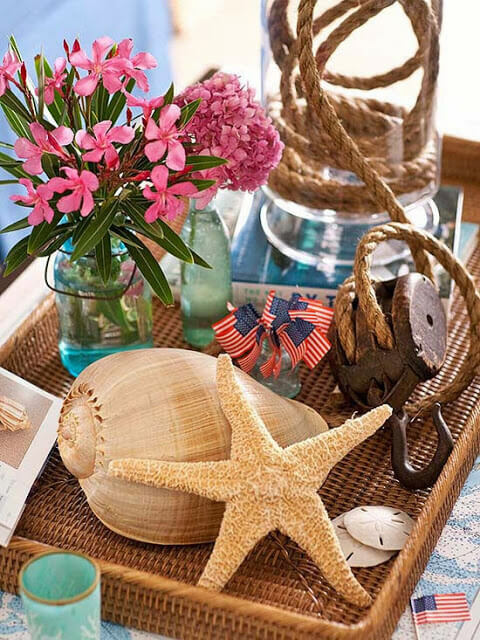 A starfish and various seashells. Vintage elements and a candle. All gathered in a wicker tray. 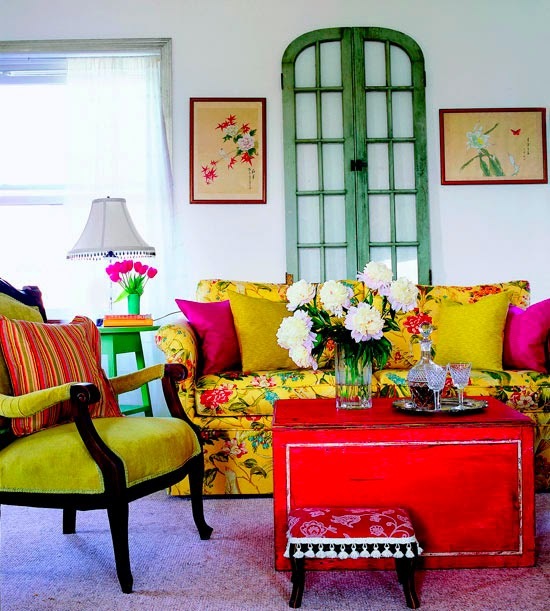 This room has so much color you might need sun glasses. A bright orange wooden coffee table, with a small ottoman in front. A moss green chair adorned with a striped pillow. And then there’s the yellow floral couch. 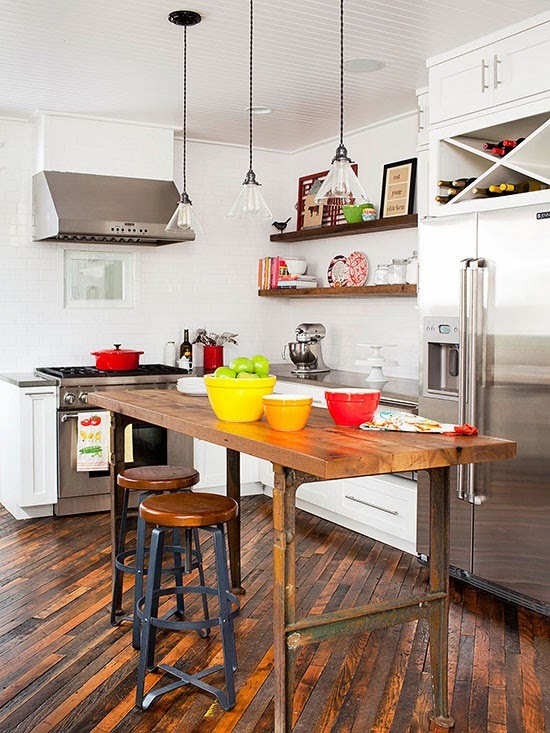 I love the kitchen island above. And the wood floors set at an angle. A very different look in flooring. If you want neutral furnishings, then just dabble with color in the way of bowls or accessories. Books, books, and more books. 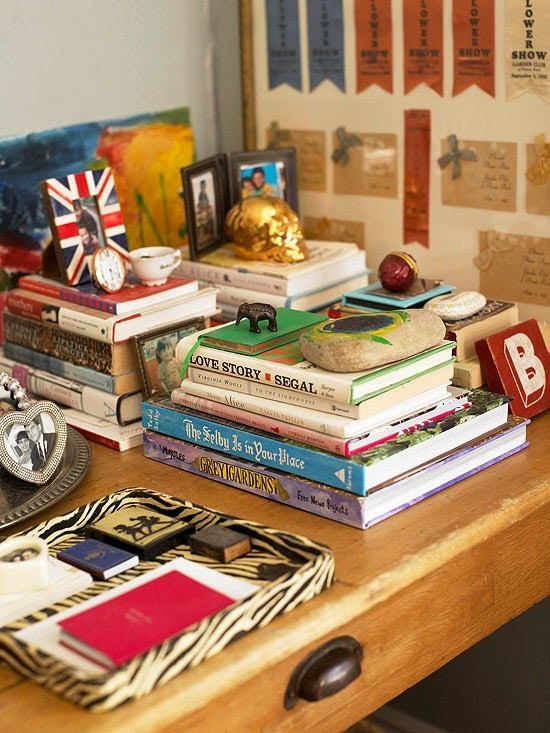 This coffee table is piled with books in small stacks with little bits of decor on top. It makes one wonder if this decor was collected on travels around the globe. 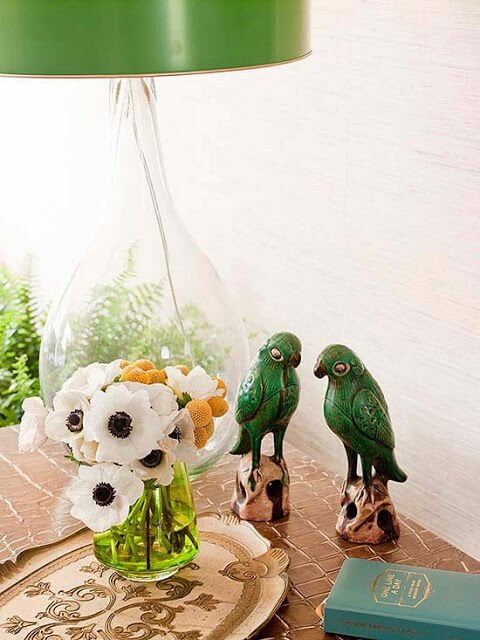 The two green parakeet steal the show in this vignette. White flowers and books anchor the whimsical and colorful ceramic birds. This dining room bordering on the living space is all in neutral colors. The color is in the accents. 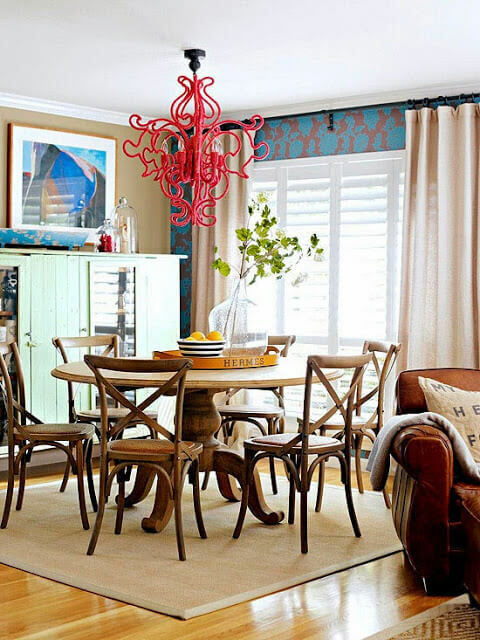 The bold red chandy and the painting on the wall above the mint green cupboard make up the color in this room. 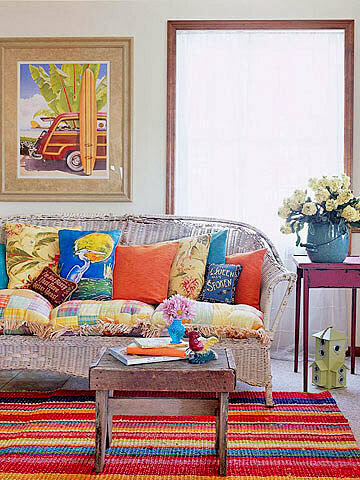 This room has a slightly bohemian look. 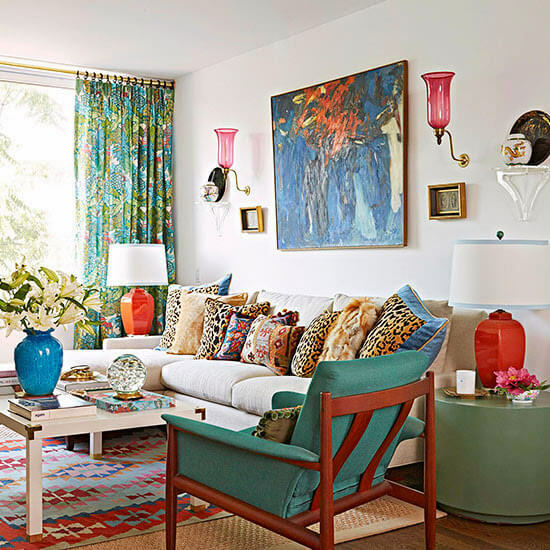 The punchy curtains and the pretty Navajo rug are the patterned elements in the room, along with a vast array of throw pillows. 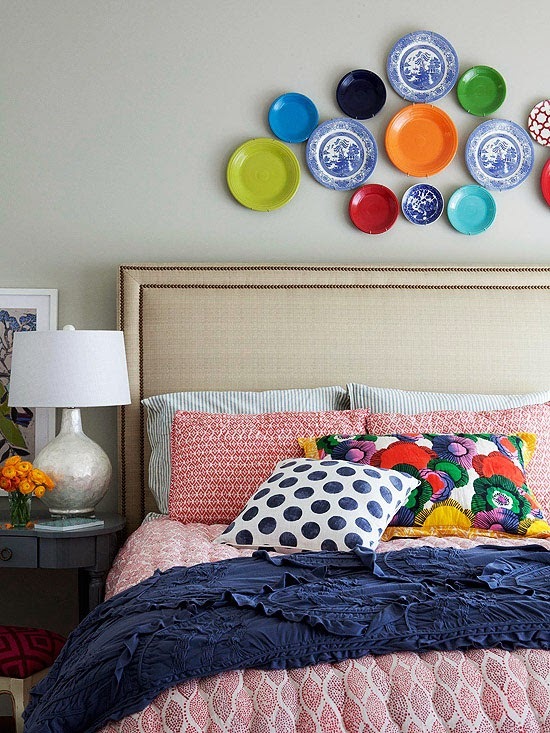 This bed has a fun wall display above it in the way of plates. A group of colored plates forms a casual shape. It is certainly eye catching. This room is so well put together. Just look at the bead board navy blue back of those shelves. A gorgeous contrast that mimics the blue and white ottomans below. I'm loving the bold patterned curtains in the Bohemian room!